While most Netflix and Amazon Prime subs are unlikely to abandon either service, Disney could convince a lot of them to sign up for at least one of its three services. It increasingly feels as if a large portion of U.S. households will subscribe to and actively use either two or three video streaming services. That's worth keeping in mind as Disney's (DIS - Get Report) streaming strategy is gradually fleshed out. Though the media giant would love for U.S. consumers to sign up for all three of the streaming services it will have available by the end of 2019, its ultimate goal may be to have a large percentage of households using at least one of the three, in addition to Netflix (NFLX - Get Report) and Amazon.com's (AMZN - Get Report) Prime Video. Many consumers will prefer to have more or less than two or three streaming video services, of course. Some -- particularly those who still watch a lot of pay-TV -- might be fine actively using just one streaming service. And some cord-cutters who spend a lot of time consuming video might be willing to pay for four or five, as might some larger and/or more affluent households still using pay-TV. However, judging by surveys, public disclosures from streaming providers and anecdotal observation, there's a strong possibility that two to three services will be the sweet spot for the typical U.S. household over the long run. And for a lot of those households, two of those services will be Netflix and Prime Video. With 58.5 million U.S. memberships as of the end of Q3, it won't be long before Netflix is subscribed to by over half of America's 126 million-plus households. Moreover, Netflix's official membership figure doesn't account for the many households "borrowing" a Netflix login from a friend or relative. Amazon reported in April that it has over 100 million Prime memberships globally. And while Amazon hasn't shared how many U.S. Prime members it has, a 2017 Piper Jaffray survey pointed to a U.S. household penetration rate of about 60%, with much higher penetration among wealthier households. It's hard to envision a large percentage of Netflix users cancelling their subscriptions due to the arrival of a new streaming service that happens to have some quality content. The service is still reasonably-priced, and the unmatched content budget that's made possible by Netflix's unmatched global scale -- the company's content-related cash outflows will likely top $12 billion this year -- remains a giant competitive advantage. The tremendous work that Netflix has put into things such as personalizing content recommendations and optimizing video for various connection and screen types doesn't hurt either. Nor does the fact that Netflix's originals have reached a level of popularity that many consumers don't want to be "left out" of the conversations that friends and relatives are having about them. A September 2017 survey by research firm Second Measure indicated that 80% of U.S. Netflix subscribers aren't signed up for any other streaming service, not counting Amazon Prime. By comparison, only 36.8% of Hulu subscribers, 28.5% of HBO Now subscribers and 27.6% of CBS All Access subcribers were reported to be solely signed up for the service in question. And over half of each service's subscribers were reported to also be signed up for Netflix. Meanwhile, Amazon Prime commands tremendous customer loyalty, costs just $10 per month when purchased on an annual basis and is of course subscribed to for many perks other than just access to Prime Video. And with Prime Video's annual content spend having reportedly reached $5 billion, Amazon is building up a fairly impressive library of original and licensed material of its own. If the lion's share of U.S. streaming subscribers wind up having access to both Netflix and Prime Video, and a large percentage of those subs are at most only willing to sign up for one more online video service, that spells an intense fight among the market's various other players to provide that third subscription. This struggle to win over consumers unlikely to ditch either Netflix or Amazon is already producing casualties, as niche streaming services such as Korean content provider DramaFever and classic film provider FilmStruck get shuttered. In this fight, which also features players such as CBS (CBS - Get Report) and AT&T (T - Get Report) /Time Warner's HBO, Disney's apparent strategy is to launch three services that each cater to a different audience. The Disney+ service, which launches in late 2019 and is promised to be family-friendly, will cater to households with kids as well as fans of Disney's marquee sci-fi and superhero franchises. "We hoped for more information during Disney's Q3 earnings call on both the integration of its Fox assets and Disney+, but we'll have to wait a little bit longer to hear what the new Disney looks like," said Zev Fima, research analyst for Jim Cramer's Action Alerts Plus portfolio, which owns Disney. "Management plans to provide more details on the direct-to-consumer business and post-Fox Disney (assuming the transaction will have closed by then) at an April Investor Day." Unlike Disney+, Hulu, which Disney will own 60% of once its deal to buy a large chunk of Fox Networks (FOXA clears, will largely cater to fans of TV shows -- including shows that are aimed solely at adult audiences -- while also delivering those consumers some licensed films and original shows. And the ESPN+ service is quite clearly aimed at sports junkies. Disney+ and ESPN+ are each hamstrung to an extent by Disney's need to protect large, existing, revenue streams. Though Disney+ will be the exclusive streaming home of Disney, Pixar, Star Wars and Marvel films, these films will still get shown in theaters first. 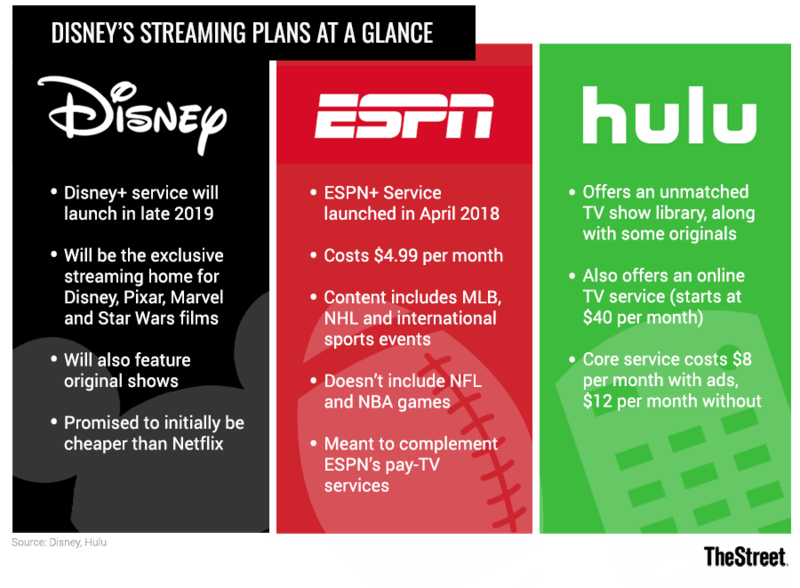 And Disney's most valuable sports programming, including all of its NFL and NBA games, will still only be available to pay-TV subs with ESPN access. Nonetheless, Disney's giant arsenal of film/TV franchises and programming rights do position it well to sell at least one streaming subscription to many of the households consuming Netflix and Prime Video. Moreover, as former Amazon Studios exec Matthew Ball argued earlier this year, Disney could conceivably bundle various non-streaming perks, such as merchandise and theme park discounts, with Disney+ subscriptions. Disney+ still doesn't look any more likely to seriously hurt Netflix's momentum than it did when Bob Iger & Co. unveiled their plans for the service (unnamed at the time) back in Aug. 2017. However, if Disney+, Hulu and ESPN+ can each win over some meaningful portion of U.S. streaming consumers thanks to their respective strengths, then building a Netflix-killer -- and for that matter, an Amazon-killer -- probably won't be necessary.